Stephanie Wyatt, Assistant Director of Admissions, and Mack the Wildcat, reading The Girl with the Dragon Tattoo, by Stieg Larsson. 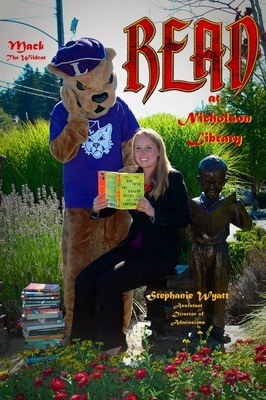 Terry, Paula and Nicholson Library Staff, "Stephanie Wyatt and Mack the Wildcat READ Poster" (2014). READ Poster Gallery. Image. Submission 133.